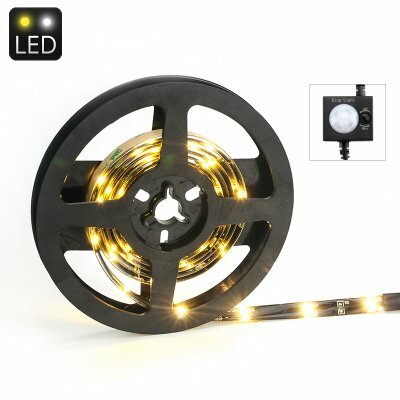 Successfully Added 1.5 Meter 3028 LED Light Strip - 3.6Watt, 45LEDs, 3 Meter 120 Degree PIR Sensor, 30Sec To 9Minute Lighting to your Shopping Cart. Install the light sensitive PIR sensor controlled strip light and never have to search blindly for the light switch again night. This LED light strip is more than just for decorative adornment in your home. Coming with a light sensitive PIR sensor this LED strip light uses 3528 LEDs to bring you a soft lighting effect without producing glare. Used with the adhesive backed cable clips making it easy to mount the lights in a wardrobe, bathroom, hallway, staircase or any other room, for quick easy lighting whenever you need it. No more searching for light switches in the dark, no need for phone apps or controllers, with its light sensitive PIR sensor these lights will only come on at night when you pass within 3 meters of the sensor. With its 120 degree detection angle it can be pick up movement across a wide field and a built in timer allows you to adjust the LED light strip to come on from 30 seconds all the way up to 9 minutes. Whether you frequently get up in the night, want a light for when you get home and its dark or just some soft mood lighting that you don't need to switch on or off, this LED light strip solves all your lighting needs and comes with a 12 months warranty, brought to you by the leader in electronic devices as well as wholesale LED lights..